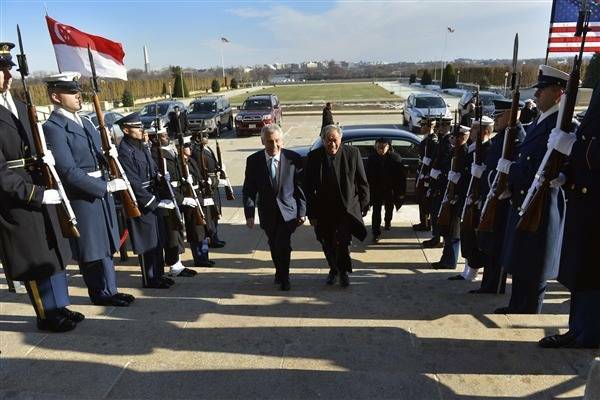 Hagel, Ng in Singapore: Photo credit US Govt. The United States-Singapore relationship takes on particular importance in light of the Defense Department’s strategic rebalance to the Asia-Pacific, Defense Secretary Chuck Hagel said during a joint press conference with Singapore Defense Minister Dr. Ng Eng Hen. Singapore is making important contributions to U.S. counter piracy efforts in the Gulf of Aden, in addition to being a significant partner in Afghanistan, Defense Secretary Chuck Hagel added. During their meeting, Hagel and Ng also discussed new ways to increase bilateral collaboration in cyber and maritime security. The two countries are seeking to develop more complex exercises and to conduct additional exercises involving more nations, Hagel said. China’s unilateral decision to expand its air defense identification zone into the East China Sea was an attempt to “nfluence the status quo, Hagel said. And while the move has raised regional tensions, he noted, it will not change how the U.S. military operates in the region. The U.S.-China relationship will impact all countries in the Asia-Pacific region, Ng said and there will be strategic competition. It was in this light that Singapore signed a memorandum of agreement in 1990 to allow U.S. ships and aircraft to transit Singaporean naval and air bases. A strategic framework signed in 2005 paved the way for the recent and future deployments of littoral combat ships, Ng added. These rotational deployments are expected to continue through at least 2015, Hagel said.